As if the city of Boston hasn’t had enough energizing moments the last few months, here comes arch rival LeBron James, in his first trip with the Los Angeles Lakers to the Boston Garden. If that isn’t enough to get the fans fired up, the Celtics are trying their best to bring down the house tonight. 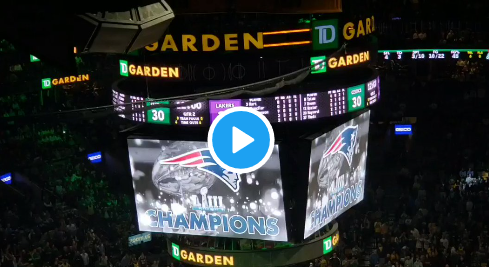 Bill Belichick and many New England Patriots are on hand tonight to celebrate their Super Bowl victory and Celtics legend Kevin Garnett is also making his return. This is the 2nd Boston Championship over the city of LA in the last few months. The Patriots followed up the Red Sox World Series title over the Dodgers. Hopefully this will be the next passing of the torch to the Celtics who are on fire lately having won 5 in a row and 11 of their last 12. The only blemish recently was a 115-111 loss to the Golden State Warriors. Hopefully this team is finally getting ready for a championship run. You can be sure you will be hearing plenty of chants tonight. BEAT LA! BEAT LA! BEAT LA!